Mothers Day weekend was a rainy one, so our plans shifted to family time indoors. Did you get some time with your family? I was missing my mother, but felt so blessed to celebrate the day with my little ones. Little Gabriel helped make me a breakfast of "special pancakes." So precious. Gabe and I did get to have a night out at the symphony with some great company. If you visit Atlanta, you also must check out the Marietta Diner (featured on Food Network). The food is killer! P.S. IHOD reached 2,000 facebook friends, so head over to check out today's celebration giveaway! You won't want to miss! Also, its the last day to enter the Deloom shopping spree giveaway! 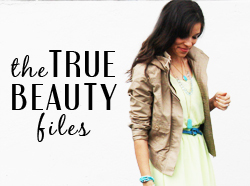 To link up with this months True Beauty Files Post, leave your info below. Please use the button or text link back to this original post! okay, so I'm kind of in love with your wardrobe. How do you look so cute all the time?! oh, and I love your new hair! Sounds like you had a great weekend despite our nasty weather. Love that striped dress!! Perfectly put together outfit Anna. So happy to hear your Mother's Day was good...rain and all! It was so hot here I thought I was going to faint ha! I have that skirt! 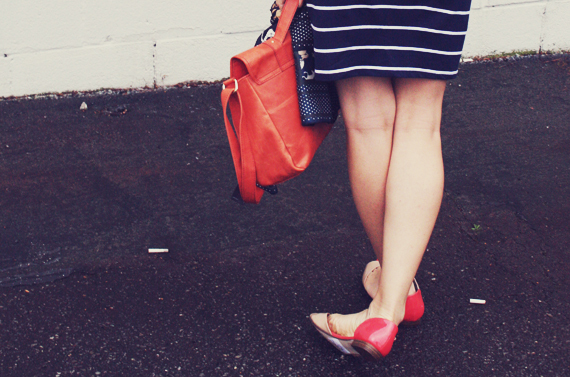 In fact, I just styled & shot it for an outfit post in the near future ;). Love it. LOVE those stripes - so nautical & classic. i've daydreamed for years about coloring my hair but have never had the guts to finally do it. good for you for having the courage! p.s the shot of your mom and you is beautiful. Thank you for hosting us Anna! 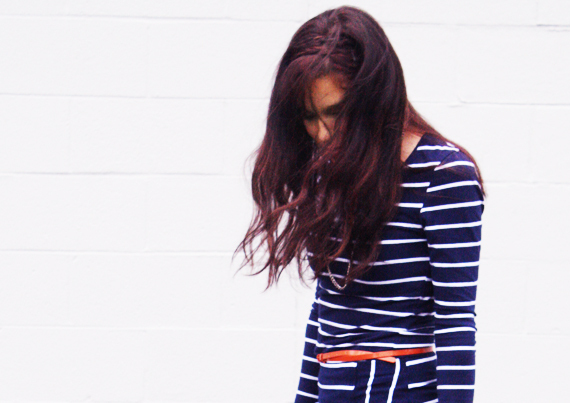 And I did a little tribute to stripes on the blog yesterday. I've always shied away, but now I'm diving in....and I have to say that dress is gorgeous on you! OH! I love this outfit!! :) I thought that was a dress, I cant believe its a skirt and a shirt. Oh. Also. Plan on linking up next week! This outfit is perfection. Those shoes omg...LOVE! ah happy mothers day you hot mom you! you look lovely in these photos. and i want those shoes. Sometimes I'm in awe of how beautiful you are. And you know what I realized? It's not just your outward beauty (which is, of course, stunning), it's more than that. You have that "God glow" about you. That "I'm loved by my heavenly Father" glow, and it's breathtaking. Keep on shining girl. I adore those shoes! So cute! everything about this is absolutely lovely, Anna! The color combination is one of my very favorites! Love this. It looks great on you!! You look absolutely stunning, Anna! ooh lala- one of my fav ensembles to date! Love the auburn...you totally rock it! that dress is just the cutest - so easy to style. Love the horse print in the mix as well. gorgeous! i love this outfit. adore the dress, and love the scarf too; it's tough to see the pattern, but i bet it would be fabulous with a well-tailored white blouse. So glad that you got some pancakes for Mother's Day! :) And that beautiful nautical scarf is lovely. You're so beautiful it kills me! Love the new hair- it has great auburn highlights! Your outfit is perfectly put together as usual! first of all, I LOVE the hair--so perfect for you. and I CAN NOT believe that is a shirt and a skirt from 2 different places that match absolutely perfectly and look like the cutest dress ever! love the shoes and the scarf as well. glad you had a nice Mother's day!! How cute are you?! Love that dress. I am on a clothes buying moratorium because I am in the middle of a major diet and luckily I am dropping some serious weight so I don't want to waste any money buying clothes i the middle sizes. I might enlist you for some help when I get to my goal. Hope you are doing well! I love the new hair, and this awesome striped dress! That is something I really want to add to my wardrobe right now! I hope you had a great Mother's Day Anna! Oh my goodness - that is a skirt and a shirt?? I completely thought it was a dress...love the whole outfit, wish I was wearing it tomorrow! you are so beautiful, friend! love the outfit too - stripes and pops of red, i'm in love! That’s really chic! Love the outfit and the bag. Got my eye on those shoes. I just stumbled upon your blog and I'm so glad I found it! I love your style! Great outfit, love the photos!!! You look SO gorgeous!!!! This might be one of my favorite outfits! I have always had a thing for stripes - and I love the bright punches of color you added! So pretty! I totally thought you were wearing a dress! Your hair turned out great :) Hope you had a wonderful Mother's Day! love this look..nautical is SO my fav this spring! I totally thought it was a dress...ha. These stripes look goos on you - and so does your here! Don't change the dark color please - it suits you so well! Super cute look! 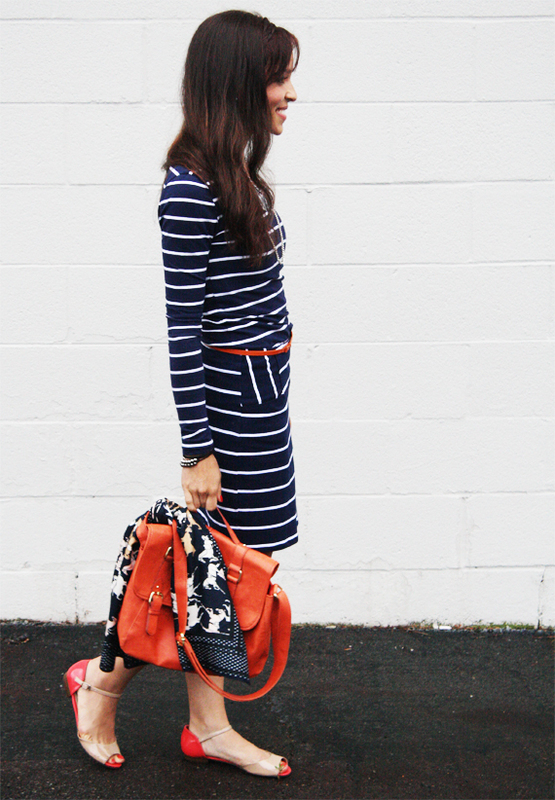 Loving your dress and pops of orange! I'm finally catching up on my blogs! I want those shoes! This has to be my fave outfit of yours Anna, you look amazing and the way you accessorised it is superb! LOVE this look, and I love your hair! I really want those shoes. Hi! I love your DIYs! I've been having a hard time finding a necklace that would go with a striped tee I have, then I saw this necklace and fell in love. It's so simple and prefectly lovely. So I made a chain and teardrop necklace like your's, and I love it! I'm going to post it on my blog, with a link back to you, since you gave me the idea. Thanks!